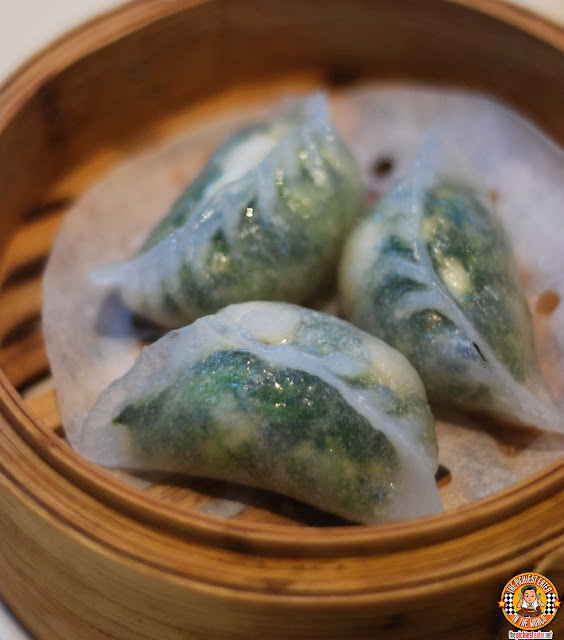 THE PICKIEST EATER IN THE WORLD: CRYSTAL JADE DINING IN: UNLIMITED DIMSUM MADNESS + ANNIVERSARY GIVEAWAY #1!! You asked for it, (fine, I BEGGED for it) and Crystal Jade listened! The Weekend Dimsum Buffet is Back! 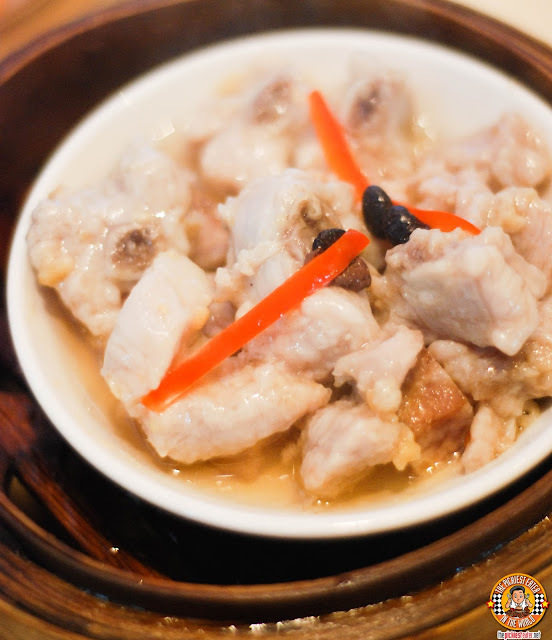 For P788++, you may select from an impressive line up of freshly made dimsum dishes that the Crystal Jade name has become synonymous with! The promo started last May 30, and is available from 2pm to 5pm at Crystal Jade Dining IN at Bonifacio High Street Central. The offer includes free flowing iced tea, and complimentary noodles for groups of 4 or more! Children aged 12 and below are charged 50%. 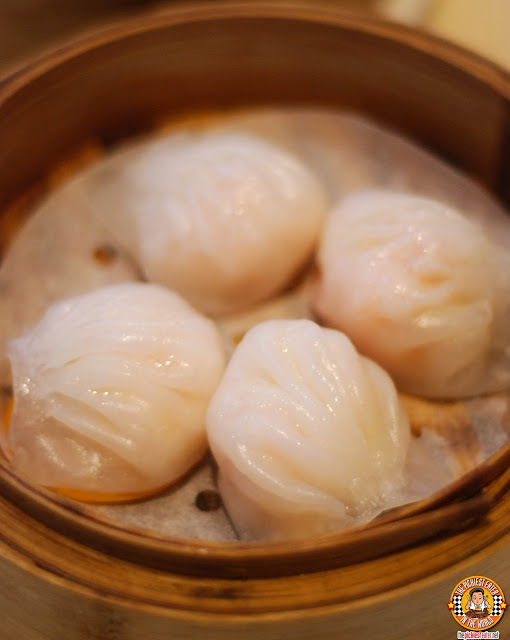 Here's a glimpse of some of the mouth watering dimsum items available in Crystal Jade Dining In's Weekend Dimsum Buffet! And since it was unlimited, she decided to try the Steamed Shrimp and Spinach Dumpling as well! I, on the other hand, worked on numerous baskets of their Steamed Pork and Shrimp Dumpling, aka Siomai! 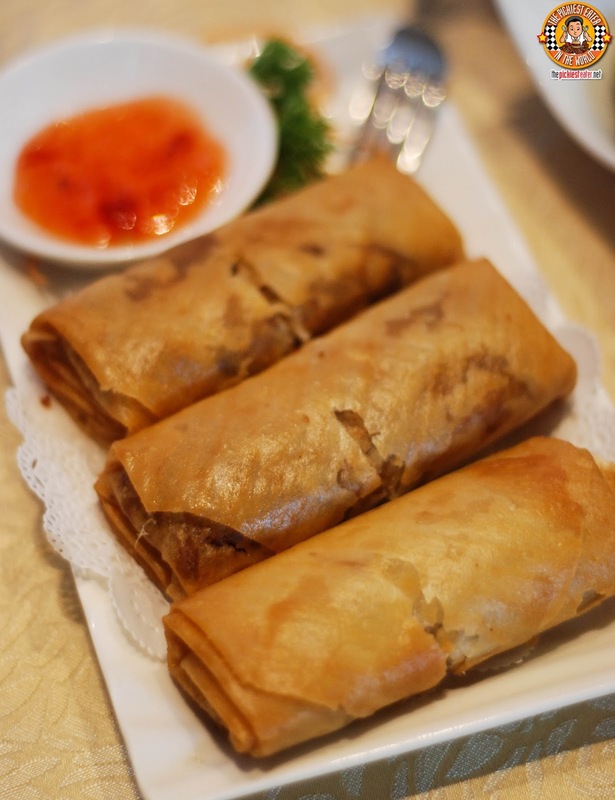 I also really enjoyed Crystal Jade's version of the Steamed Rice Roll with BBQ Pork and Coriander. Definitely something you must try! 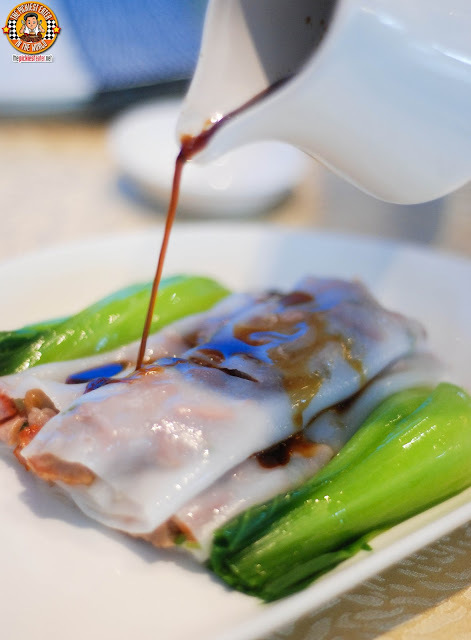 Whenever we eat in a Dimsum place, it is absolutely mandatory that Rina order one Steamed Pork Rib in Black Bean Sauce each. Our marriage depends on it. Another dish that I absolutely loved from Crystal Jade Dining In, was the Steamed Cream Custard Bun with Salted Egg Yolk. 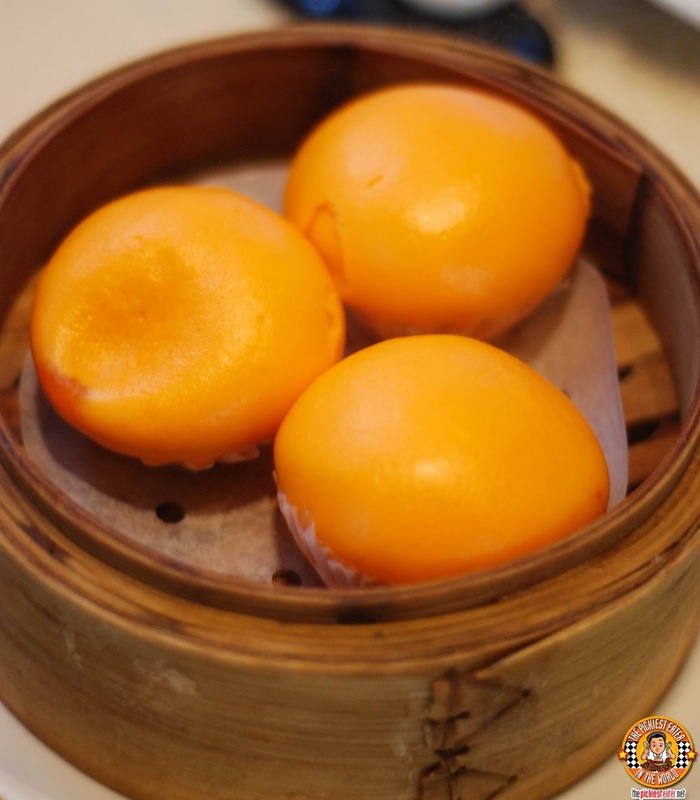 The soft, steamed bun reveals a luscious, creamy custard filling, with the gentle touches of salted egg yolk, for added awesomeness. We also ordered the Deep Fried Shrimp and Chicken Spring Roll from the fried section, however it was clearly my least favorite among everything we tried, but still worth a try. 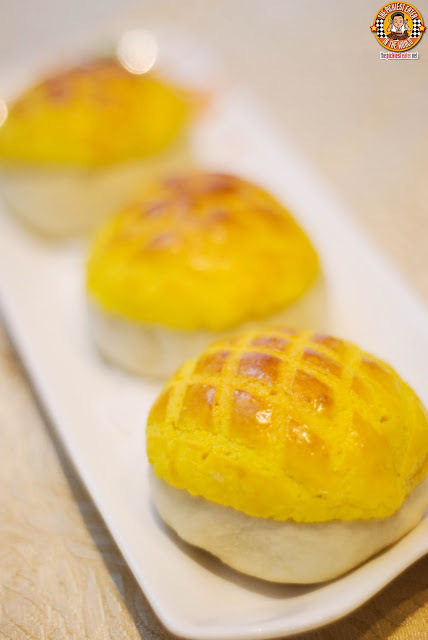 My favorite item on the Dimsum Buffet menu is without a doubt, the Baked Bo Lo BBQ Pork Bun. Biting through the soft bun revealed a delicious BBQ Pork mixture that is the perfect blend of sweet and savory. In the battle of the best Pork Buns in the Metro, Crystal Jade's Baked Bo Lo BBQ Pork Bun can stand toe to toe with the best the country has to offer. 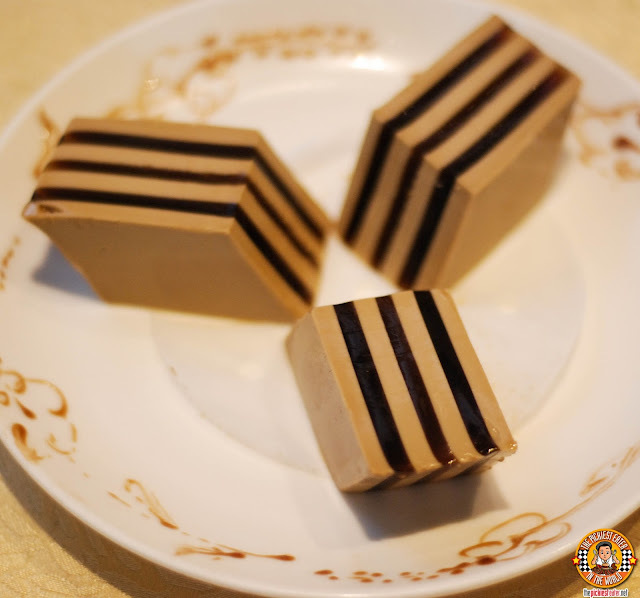 Rina ended her meal with the Coffee Jelly, which she really enjoyed. I'm not a fan of Coffee, so I opted for.. The Japanese Glutinous Rice Dumpling with Mango Cream, which was nothing short of amazing. 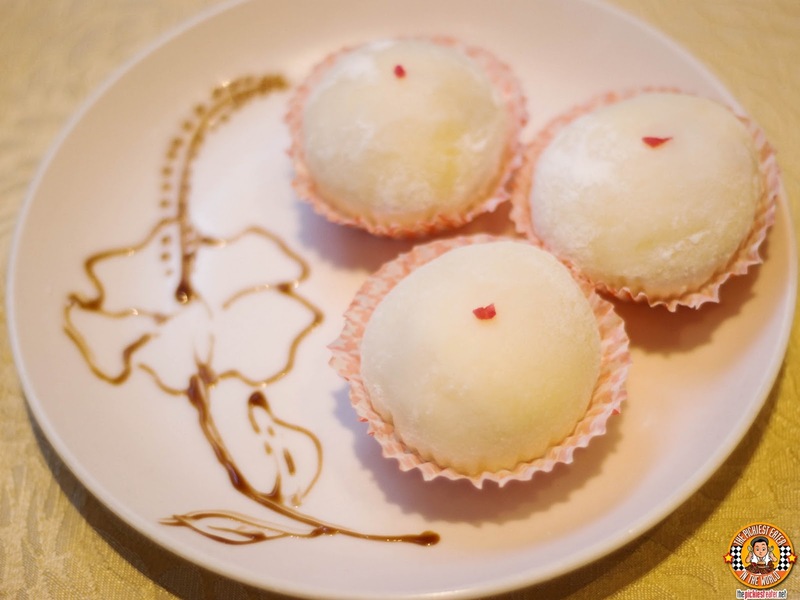 I initially thought it was one of those frozen mochi desserts, but it turned out to be a cold mochi, filled with a mouthwatering sweet mango cream. The perfect way to end your meal! As we were finishing up our meal, we were elated that our Idol, Kapitan Jeff, (aka the man who add's the spice to Jane Go's sugar), joined us for a short chat! We Missed you Kap! Nice to see you and the family!! 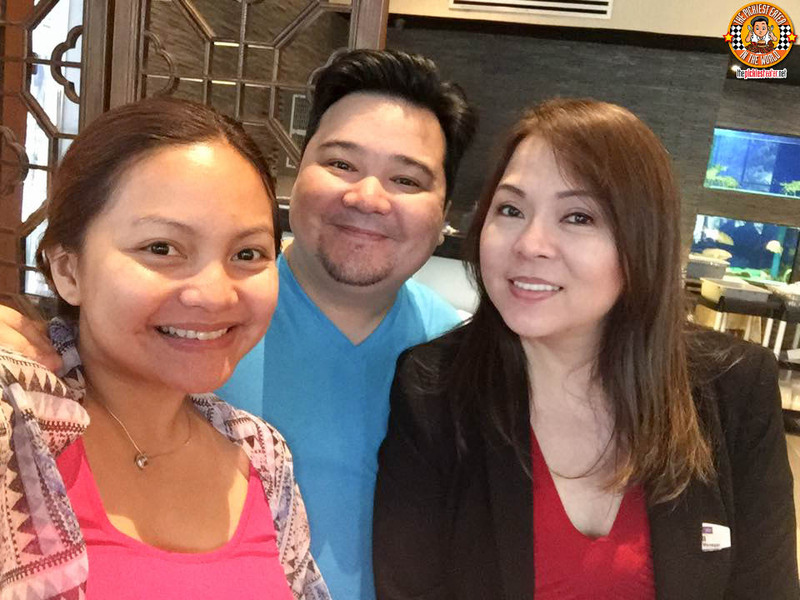 Thank you to Kenneth, Miriam and Aida for the amazing dimsum experience! 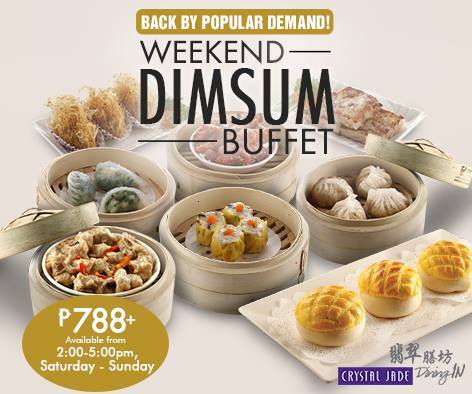 Would you like to experience Crystal Jade's Dimsum Buffet? Join the first giveaway for our Fifth Anniversary NOW!!!! Please send me and email at pickiesteater@gmail.com with your address and contact details so I may send you your GC! Please do it ASAP because you only have 2 weekends of Unlimited Dimsum Buffet left!!! If I don't hear from you within 3 days I will be forced to draw a new winner! I wish they had this at Greenhills too! they have it on the weekdays! 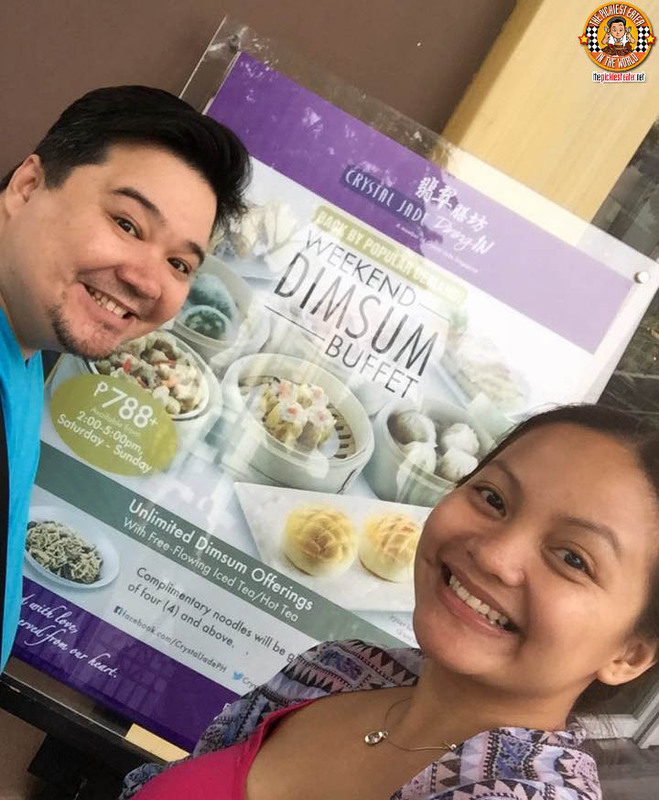 My friend Yedy is hosting a giveaway for the weekday dimsum buffet! Nice to see you and the family! See ya soon! I will bring my shopping buddy/foodie buddy/travel buddy with me since she badly needs a good treat. I will bring my wife with me. I will bring my boyfriend with me because he hasn't tried Chinese food yet. I'm sure he will love it! I would bring my boyfriend. 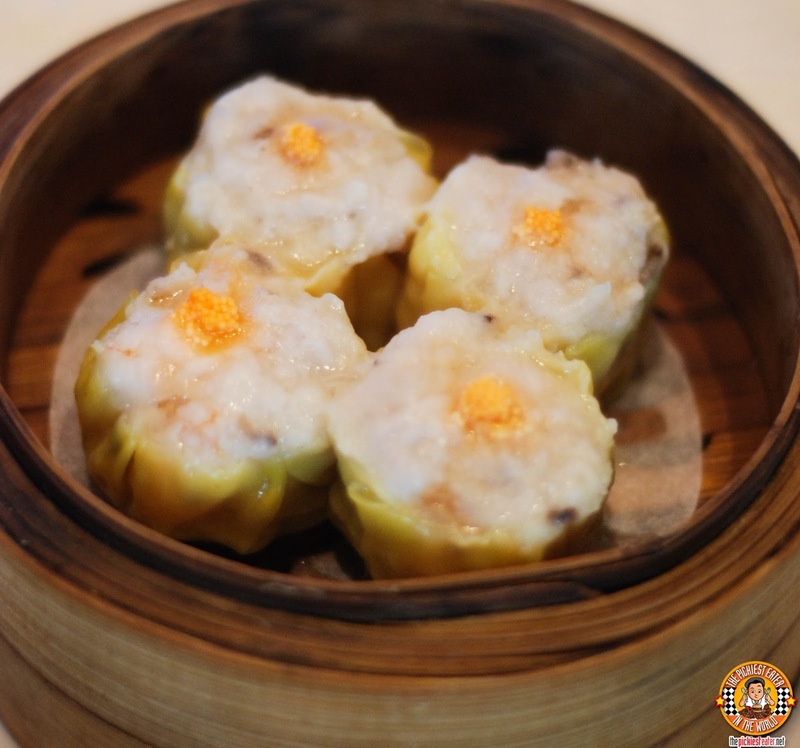 We love dimsum! Will be going with my ultimate dining buddy, my boyfriend. We love dimsum. Yum yum. I will bring my mom because we love dimsum! Oh yes! I love dimsum, I'm joining! 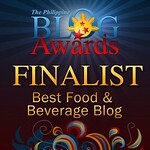 This'll be an awesome birthday treat for me and my foodie friend, Yans! I will take my wife my foodie partner! Ill pig out with my hubby . 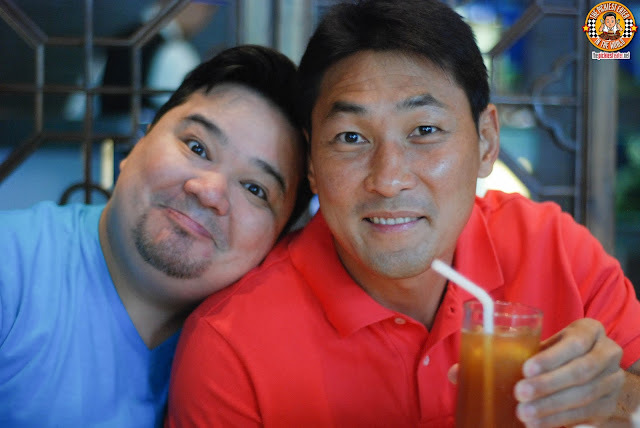 I will take my hubby and that will serve as our Father's Day celebration! I will bring my husband with me at the Weekend Dimsum Buffet because we both love food. The whole family will most probably tag along, too. Haha! Wohoooooo syempre sasali ako .... I'm bringing who else but my brother!!! He is ibto dimsum and I wanted him to experience this .... We had a couple of family events kaya ... Weren't able to try this out lol... Balang araw we will!!! I would bring my husband with me to the Weekend Dimsum Buffet. I will take my mother with me to the Weekend Dimsum Buffet a post mothers day gift for her! I am going to bring my mother with me to to the Weekend Dimsum Buffet! Who will you take to the Weekend Dimsum Buffet? 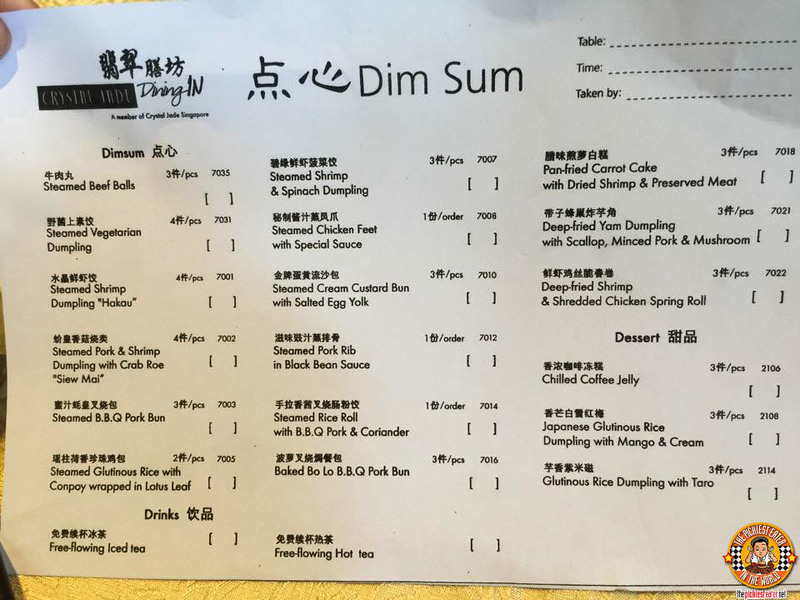 I will bring my Girlfriend to the Weekend Dimsum Buffet. Missed out this also...hahhaha..I am a fan of dimdum as well. I will be tagging my husband Richard along with me! Want this! 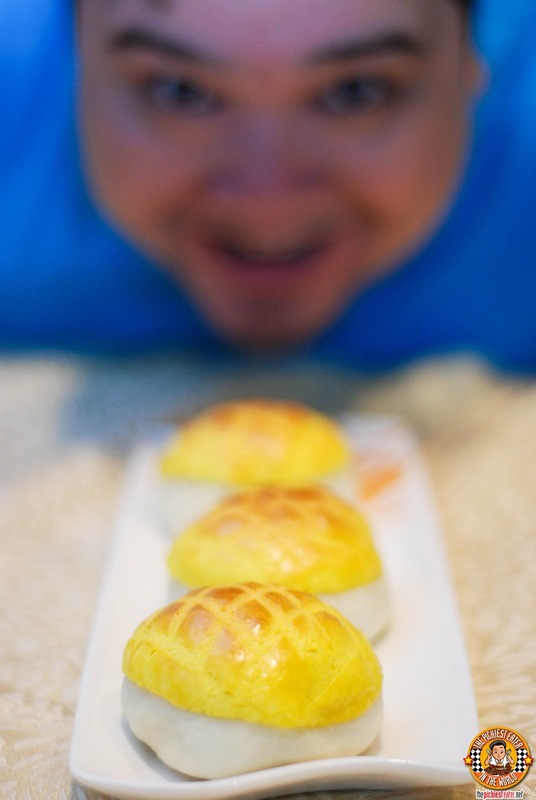 I will bring my husband and my 2 kids to celebrate Father's Day..
Will bring my dimsum addict bestfriend! I will bring my hubby & kids to enjoy this weekend dimsum buffet.! When I saw this post, I immediately thought of my significant other. This is without knowing what you asked in the "leave a blog comment". Why I thought of him? Because he is the best buffet partner I've ever known in my entire life (I am only 33. :D)! And aside from that, both of us are into Chinese cuisines. And whenever we go crave for Chinese food, the number one resto in our list is of course, Crystal Jade! Just mentioning the restos name makes my tummy growl in hunger for dimsum! hahaha! My mom has been my best buddy when were talking about buffet! :) We both love Dim Sum! I will bring the whole family even if I have to pay for the others Their Dimsum is so delicious that it is better share with the whole family. I will bring my wife and kid. I'll take my best friend Ging! i would bring my husband if i win!